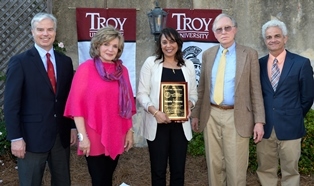 "I am deeply honored to receive the Hall-Waters Prize and to accept it today in memory of Wade Hall," Trethewey told the Troy University Trojan News Center. "This is the first prize for southern literature that I have ever won. "I am a southerner," she continued. "It is the place that made me. It is my home. It is the place that has given me everything I have to write about. It means everything to me to be honored by you as a southern writer. It is, I think, my birthright. Thank you for restoring it to me." Gregg Swem, long-time partner of Wade Hall, addressed the assembled guests about Hall’s love of poetry, his history of publishing poets, and the appropriateness of Natasha Trethewey’s receiving the first award exclusively for poetry. "Natasha Trethewey is a singular voice in American letters today," Dr. Kirk Curnutt told the Trojan News Center. "Her work is unflinching in addressing the racial realities of America past and present. Her poems and non-fiction are both informed by impeccable research while remaining accessible to general readers. More than anything, her career is a testament to the importance to taking literature to the folk. We're honored she would accept the Hall-Waters Prize and thrilled for her to appear at the Alabama Book Festival." Curnutt, chair of the English Department at Troy University, is a director of the Alabama Book Festival, co-sponsored by Troy University with the Alabama Writers' Forum, Old Alabama Town, and several other organizations. Trethewey read several poems from her latest work to those gathered in the courtyard of Young House in Old Alabama Town. Because of her deep connection to Alabama—where she got her literary start while teaching at Auburn University—it was particularly meaningful to her to receive the award from Troy University at the 2016 Alabama Book Festival. Trethewey was awarded an Alabama State Council on the Arts Literature Fellowship while at Auburn University. She read from her first book in manuscript, Domestic Work, at Huntingdon University during that time. Other Southern writers who have been honored with the Hall-Waters Prize include Shirley Ann Grau, Sena Jeter Naslund, Rick Bragg, and Bobbie Ann Mason. For the past two years, the Hall-Waters Prize has been a part of the Alabama Book Festival celebration.